Update: 05/05/2014 It's way past due, but I finally updated the A Link Between Worlds Hylian Shield to reflect the finalized artwork. 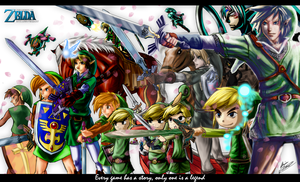 Update: 06/14/2013 A Link to the Past gets another sequel, which means a new shield! Also, the wallpaper has been expanded to 3200x2000 in anticipation for further expansion. I'm looking at you Zelda Wii U*! Update: 06/05/2012 The shield from the recently shown Legend of Zelda: Battle Quest is now present. The previous version of this wallpaper can be found here sta.sh/0c30f18t0qm . Update: They may have reduced the detail for the crest a little, but I consider the shield in Four Swords/Four Swords Adventure/The Minish Cap to be the same as Wind Waker's. Nice job on the collection! Amazing, there always a little bit different. My favorite is Oot and Tp. Your missing a few there. Can't Link just keep the same shield for once? Can I have them as a render please , every single one of them ! Honestly I think Twilight Princess shield is best looking. It would be helpful if you check my work: 255 & 255 BW, Specially 2SS. who knew that Hyrule use to have Christianity? Not necessarily. Either symbol could represent something else entirely in Hyrule. More like hardware limitations, plus everything we know about the Zelda universe didnt come til at least at link to the past. ...what about the mirror shield? this had to take forever. It's amazing. Link has had different shields throughout history it seems. And they only got more creative as time went on. Which is a good thing. I think Wind Waker is the best one, normal shield and mirror shield. And I think I just started a opinion-war. I removed this from my favorites just so I could readd it again. wow, the MM's shield is so weird... I never noticed. Spirit Tracks is the one I want.